By Hans J.A. Dekkers, CEO and Founder of Dynaread. In this concise article I seek to touch on some of the areas relevant to the field of reading and remediation, with an emphasis on those pertaining to Dynaread's method of intervention. 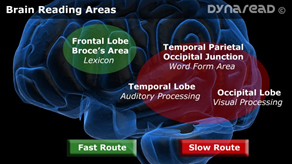 • The Reality of the Fast and Slow Route reading system (the article lets you experience how reading actually works in the brain). More and more has been uncovered about the processes that take place in our brain and multi sensory systems when we decode those funny little scribblings we call letters. Researchers have produced many different computer models aimed at simulating the experience of reading. Models which, when presented with the printed word, respond in the same fashion as a human reader. Not only in straightforward cases, but also when presented with all sort of challenges: different forms of dyslexia; the presentation of nonwords (such as: bewane); etc... An accurate computer model should ideally in all cases produce the same results as a human reader with similar ability. Research has resulted in consensus concerning the existence in the human reading system of two separate procedures for reading, or - in other words - the existence of two main routes, dual routes, that bring a reader from print to speech. These so-called Dual Route models demonstrate the existence of a lexical and a nonlexical route. We will take a closer look at Prof. Coltheart's Dual Route Cascaded (DRC) Model , which behavior and performance can account for both development and acquired dyslexia . The DRC model (above), consists of a lexical procedure or route (semantic and nonsemantic), and a GPC or grapheme to phoneme route. Each route is composed of a number of interacting layers. One is through inhibition, where the activation of a unit makes it more difficult for the activation of other units to rise. The other is through excitation, where the activation of a unit contributes to the activation of other units. The lexical procedure identifies an orthographic representation (i.e. letters, and their sequences and groups) in the orthographic lexicon, and proceeds from there to the phonological output lexicon (sounds). It is of importance to point out that this lexical route is incapable of producing correct phonological expressions of nonwords. Nonwords are words that look like normal words but are not. It will attempt a phonological match, but on a lexical base only. Consequently, the nonword SARE may result in the phonetic expression CARE, SORE or SANE as these come close to the orthographic representation. The nonlexical route, in the diagram the route that proceeds via the grapheme-phoneme rule system, interprets the orthographic representation, identifies the graphemes (smallest groups of letters representing a single phoneme or sound) and translates these to phonemes. This route can successfully process nonwords, however rule-based pronunciation of irregular (exception) words will be incorrect. In the initial stages of research when the dual route model was pioneered, it was thought that the process resembled a horse race: The winning horse (lexical or nonlexical) produced the speech. That metaphor proved inaccurate and inconsistent with findings. An accurate metaphor is that of two taps filling a bucket. When the bucket is full, speech is produced. In dyslexia one of the taps struggles and adds little water to the bucket . The aforementioned inability of the lexical route to properly read nonwords is of importance. Current research consensus argues that the majority of development dyslexics are encumbered by a phonological processing deficit , making the GPC route only partially available. Already in 1999 Keith Stanovich wrote "The most common and accurately identified type of reading disability is phonological dyslexia (see Castles & Coltheart, 1993; Manis, Seidenberg, Doi, McBride-Chang, & Peterson, 1996; Stanovich, Siegel, & Gottardo, 1997), and its primary indicator is difficulty in pronouncing pseudowords". Though consensus regarding the existence of phonological impairment exists, the exact identification of the cause hereof has not yet reached full consensus. Ramus and Szenkovits performed research amongst representative groups of dyslexic and nondyslexic French university students, and their findings are noteworthy . The results of their research converge on the observation that the phonological representations of people with dyslexia may possibly be intact, and that the phonological deficit surfaces only as a function of certain task requirements, notably short-term memory, conscious awareness, and time constraints. More recently, breathtaking scientific research in the field of Neurology has made it possible to accurately map those areas in the brain that are involved in reading. Using functional magnetic resonance imaging (fMRI) it has been established that the Broca's area, Inferior Frontal Gyrus, is responsible for a relatively slow process of articulation and word analysis. The Parieto-temporal area is also responsible for word analysis: it is believed to analyze a word, pull it apart, and link its orthography (letters) to sounds. The third area, Occipito-temporal area, is the express pathway to reading open to the skilled reader. This Occipito-temporal area reacts almost instantly to the whole word as a pattern - identifying the word by sight. There are therefore three neural pathways for reading: Two slower, analytical ones, that are used mainly by beginning readers, and an express route, the Occipito-temporal, relied on by experienced, skilled readers. Dyslexic readers show a fault in the system: Underactivation of neural pathways in the back of the brain. 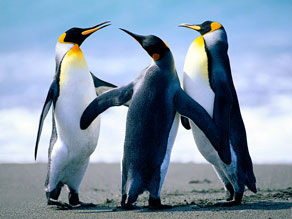 Consequently, they have initial trouble analyzing words and transforming letters into sounds . This leads us to other, yet highly relevant, scientific fields which provide insights into the process of reading, as well as into possible other impairments affecting the dyslexic. We will first proceed to the sections within Psychology and Neurology dealing with the working of our memory, and especially Working Memory (WM). Following research, Beneventi, Tonnessen and Ersland authored a 2009 article in the International Journal of Neuroscience . In it they report that a sample group of 13-year-old dyslexic children demonstrated WM impairments when compared with age-matched nondyslexic peers. What they could not ascertain was which one caused what (the chicken or the egg dilemma): Did the phonological impairment contribute to the neurologically registered WM impairment, or was the observed WM impairment one of the causes underlying the phonological disorder. But whether the one or the other: Dyslexics commonly demonstrate WM impairment. 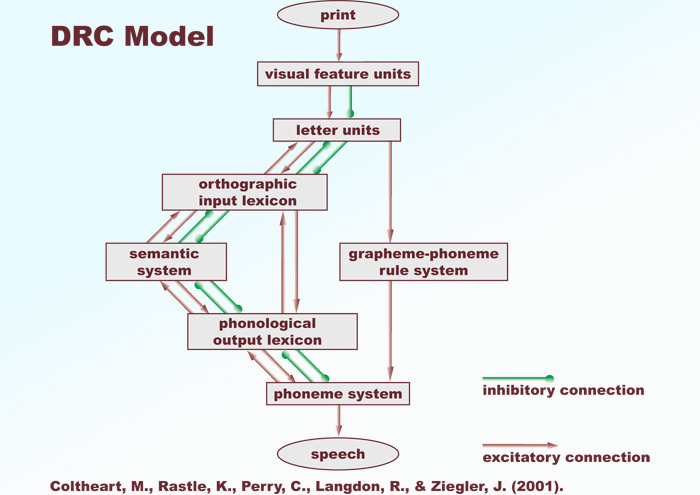 The success of the lexical route depends - in part - on the effective functioning of the semantic system (see DRC-model diagram, above). Schultz, E. et al. of the Department of Child and Adolescent Psychiatry, University of Zurich, Switzerland performed research in this field and authored an article in NeuroImage in 2008  which discusses the role of semantic processing deficits in dyslexia. Though the DRC-model demonstrates that lexical processing is able to function to some extend without the semantic system, it is evident from the Coltheart's DRC-model, undergirded by the findings of Schultz, that constructive involvement of the semantic system does increase fluency. Semantic processing is directly related to a child's stored knowledge of words and meanings, which implies that the advantage of semantic involvement is only current when the word tried to be read is already known and semantically understood by the reader. To illustrate the role of semantics in the lexical route, consider this. The word DOLLAR is recognized and understood quicker in a short story about a workday in a Bank, than in a short nature story in which a penquin stumbles upon a lost dollar bill. When we leave the DRC-model and proceed further to sentence and text comprehension (the ultimate objective in reading) it follows that contextually proper comprehension of each individual word is a prerequisite for sentence comprehension, as well as contextual comprehension. To illustrate the latter, consider this sentence: "The note was sour because the seam was split" . Try to understand the meaning of this sentence without realizing that the context is 'epipgab' (read these letters right to left, please, starting with 'b'). Intervention should be considerate of the potential contribution of the semantic system in the process from print to speech. Hence, it is advantageous to place words and text in a semantically and cognitively logical bedding. Dynaread's approach of language-based remediation, initially focussing on the resident functional Lexical Route of a child, sequentially expanding the mental lexicon, is protected by international patents pending. Another research development in recent years is that which seeks to define the role of a possible multisensory specificity in dyslexia. A 2004 study by Hairston, Burdette, Flowers, Wood and Wallace  researched the altered temporal profile of visual-auditory multisensory interactions in dyslexia. Learning to read is a multisensory process: It involves both vision and audition. From this study it has become evident that information processing in dyslexics is affected even at prelinguistic stages. Hairston et al. studied the effects of task-irrelevant auditory information on the performance of a visual temporal-order-judgment (TOJ) task, and demonstrated that integration of multisensory information in dyslexics is indeed impaired. Of relevance to dyslexia intervention is their findings that the introduction of properly timed auditory information in the presentation of visual information improves processing and integration by circa 11%. Properly timed, in this context, refers to precisely properly timed miniature auditory signals, spaced in the realm of 100 milliseconds. So this has nothing to do with optimizing the timing of verbal expressions and instructions when presenting a word or word part. We are referring here to auditory-input-triggered neurological stimuli improving the brain's ability to process and properly integrate information. The last field we will discuss is that of Ophthalmology. An outstanding read was a research paper by Solan et al. (2001) . Already in 1994 Eden et al. concluded that the prevalence of oculomotor abnormalities in nonreading tasks suggested that the underlying deficit in the control of eye movements observed in dyslexia is not caused solely by language problems . Chase et al. in 1996 observed that reading disability has been associated with a slow rate of processing in the magnocellular visual pathway . I found this fascinating, as this touched on an associated aspect I had not yet been aware of. Even as Coltheart's Dual Route model, the processing of visual information occurs via two routes, or more commonly referred to as interactive pathways: The magnocellular (M-cell) pathway, and the parvocellular (P-cell) pathway. The magnocellular pathway (10% of the nerve fibres) transfers all motion related information and low contrast black and white information. The largest path (approximately 80% of the fibres) is the parvocellular pathway that transfers all color information and high contrast black and white information . Chase's findings make us aware that intervention must be considerate of the fact that this M-cell pathway is commonly partially impaired. Congruent with this are the findings of Williams, LeCluyse, and Rock-Faucheux (1992)  and Solan, Brannan, Ficarra, and Byne (1997) . Both these research works report relationships between wavelength, luminance, and reading performance. The results of using blue filters to reduce wavelength and gray filters to lower luminance improved reading comprehension significantly in poor but not in average readers, and suggested the presence of the aforementioned magnocellular deficit. Addressing the magnocellular deficit is of relevance, because it appears that the M-cell pathways control oculomotor efficiency in reading (the oculomotor nerve controls most of the eye's movement, constriction of the pupil, and maintains an open eyelid); therefore, any alteration of the normal order and timing of relative contributions or processing rates of the M-cell and P-cell pathways can result in a visual deficit hindering fluency (Breitmeyer, 1980, 1993) . Mental Chronometry is a subfield of BioPsychology and deals with the fascinitating field of cognitive speed, which differs per individual . Effective remediation requires instruction at par with a student's mental chronometric performance. This performance level may differ per task, as task variances call on different cognitive processes and responses. In face to face remediation, a teacher seeks to experientially adjust instructional tempo to the speed which the child seems to be able to handle. In electronically administered remediation components, which are clearly on the rise, this adjustment is typically lost - to the detriment of children requiring a little more time to perform a certain task, or respond to a certain prompt. Since many schools in the Anglo-Saxon world welcome children with a variety of cognitive abilities, any form of electronic instruction puts children with a slightly lower mental chronometric performance at risk of falling behind. Likewise, students with above average mental chronometic performance are unnecessarily held back. Though seemingly a small factor, with electronic instruction usage on the increase, failure to incorporate mental chronometric adjustments will adversely affect remediation outcome. Dynaread is a pioneer in development and implementation of mental chronometric customization, which methods are protected by international patents pending. With my study filled with research papers from dozens of scholars, covering multiple scientific disciplines, all approaching the scientific challenge of dyslexia mainly from within their own fields, one strategic proposition presses itself to the forefront: What is the statistical likelihood that dyslexics, of all people, happen to be impaired in so many different fields at the same time? Could it be that consistent lack of exposure to the experience of reading is conducive to some of these impairments - or at least the magnitude of them: One specific impairment hindering a student from progressing in reading, triggering the development of impairments in other processes? If this proposition is even partly true, the first and foremost objective in intervention must be to get dyslexic children to read - one way or the other. We invite, will collaborate and seek to financially assist, further integrated multidisciplinary scientific research into this in order to improve our intervention method further. Coltheart, M., Rastle, K., Perry, C., Langdon, R., & Ziegler, J. (2001). DRC: A dual route cascaded model of visual word recognition and reading aloud. Psychological Review, 108, 204-256. doi: 10.1037/0033-295X.108.1.204. Development dyslexia refers to people who have difficulty learning to read; Acquired dyslexia relates to reading disorders that are acquired because of brain damage, where those affected used to be literate. Snowling, Margaret A., and Hulme Charles. The science of reading. Oxford: Blackwell Publishing, 2007, Page 9. Elbro, C. (1997). Early linguistic abilities and reading development: A review and a hypothesis about underlying differences in distinctiveness of phonological representations of lexical items. Reading & Writing, 8, 453-485. Liberman, I. Y., & Shankweiler, D. (1979). Speech, the alphabet and teaching to read. In L. Resnick & P. Weaver (Eds. ), Theory and practise of early reading (Vol. 2, pp. 109-132). Hillsdale, NJ: Erlbaum. Snowling, M. J. (2000a). Dyslexia (2nd ed.). Oxford: Blackwell. Stanovich, K.E. (1988). Explaining the differences between the dyslexic and the garden-variety poor reader: The phonological core-variable difference model. Journal of Learning Disabilities, 21, 590-606. Vellutino, F.R. (1979). Dyslexia: Theory and research. Cambridge, MA: MIT Press. Stanovich, K. (1999). The Sociopsychometrics of Learning Disabilities. Journal of Learning Disabilities. Sage Publications, Inc. 1999. HighBeam Research. 12 Jan. 2010 . Ramus, F., Szenkovits, G. (2008). What phonological deficit? The Quarterly Journal of Experimental Psychology, 2008, 61(1), 129-141. Subtypes of Reading Disability: Variability around a Phonological Core. Morris, Robin D.; Stuebing, Karla K.; Fletcher, Jack M.; Shaywitz, Sally E.; Lyon, G. Reid; Shankweiler, Donald P.; Katz, Leonard; Francis, David J.; Shaywitz, Bennett A. Journal of Educational Psychology, Vol 90(3), Sep 1998, 347-373. Overcoming Dyslexia: A New and Complete Science-Based Program for Reading Problems at Any Level. Shaywitz, Sally. 1st. New York: Vintage Books, 2003. Pages 75-92. Beneventi, H., Tonnessen, F.E., Ersland, L. (2009). Dyslexic Children Show Short-Term Memory Deficits in Phonological Storage and Serial Rehearsal: An fMRI Study. International Journal of Neuroscience, 2009, Vol. 119, No. 11, Pages 2017-2043. Schulz E., Maurer U., van der Mark S., Bucher K., Brem S., Martin E., Brandeis D. (2008). Impaired semantic processing during sentence reading in children with dyslexia: Combined fMRI and ERP evidence (2008). NeuroImage, 41 (1), pp. 153-168. Shaughnessy, M.F.. (2005). An Interview with James M. Royer About Reading and Comprehension. Educational Psychology Review, Vol. 17, No. 3, September 2005, pp.273-283. Hairston, W. David. ; Burdette, Jonathan H.; Flowers, D. Lynn; Wood, Frank B.; Wallace, Mark T.. "Altered temporal profile of visual-auditory multisensory interactions in dyslexia". Experimental brain research October 2005: 474-480. Solan, Harold A.; Steven Larson; John Shelley-Tremblay; Anthony Ficarra; Michael Silverman. "Role of Visual Attention in Cognitive Control of Oculomotor Readiness in Students with Reading Disabilities." Journal of Learning Disabilities. Sage Publications, Inc. 2001. HighBeam Research. 15 Jan. 2010 . Eden, G. F., Stein, J. E, Wood, M. H., & Wood, F. B. (1994). Differences in eye movements and reading problems in dyslexic and normal children. Vision Research, 34, 1345-1358. Chase, C. H. (1996). A visual deficit model of developmental dyslexia. In C. H. Chase, G. D. Rosen, & G. F. Sherman (Eds. ), Developmental dyslexia (pp. 127-156). Baltimore: York Press. Hyvarinen, Lea. "Assessment of Low Vision for Educational Purposes and Early Intervention". Lea Hyvarinen pediatric ophthalmologist. 15 January 2010 . Williams, M. C., LeCluyse, K., & Rock-Faucheux, A. (1993). The effects of wavelength on visual processing and reading performance in normal and disabled readers. In S. Wright & R. Groner (Eds. ), Facets of dyslexia and its remediation. North Holland. Solan, H. A., Brannan, J. R., Ficarra, A. E, & Byne, R. (1997). Transient and sustained processing: Effects of varying luminance and wavelength on reading comprehension. Journal of the American Optometric Association, 68, 503-510. Breitmeyer, B. G. (1980). Unmasking visual masking: A look at the `why' behind the veil of the `how'. Psychological Review, 87, 52-69. Breitmeyer, B. G (1993). The roles of sustained (P) and transient (M) channels in reading and reading disability. In S. E Wright & R. Groner (Eds. ), Facets of dyslexia and its remediation (pp. 13-31). Amsterdam: Elsevier. Jensen, Arthur R. (2006). Clocking the mind: Mental chronometry and individual difference. Amsterdam: Elsevier. Join our growing movement to structurally address low literacy in students ages 7+. Our cost will not stop you. We have but one focus: Helping children succeed.